1. Start Windows, and insert the enclosed CD-ROM into the PC. 2. When the USB Connector setup window appears, click "Ok" to begin the installation process. 3. If the setup window doesn't appear, click the "Start" button, choose "Run", then click on the "Browse" button. Click on the CD drive that the setup disc is in, then locate the Setup.EXE file and double-click it. 4. 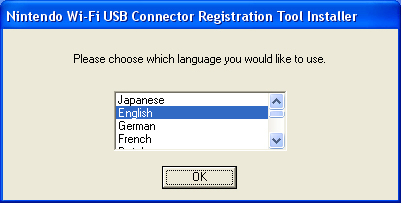 Select the language, then click "Ok". The software will begin to install. Note: If you receive the error, "You are not connected to the internet", this means that the setup utility is not able to detect an active internet connection. If you are using a laptop computer with Wi-Fi access, you must first connect to the internet before you can finish setup. 5. When directed to, insert the Nintendo Wi-Fi USB Connector into any open USB slot on the PC. 6. If the warning, "Hi-speed USB device plugged into non-hi-speed USB hub" appears, click OK. This just means the USB port is an older 1.1 USB port version. 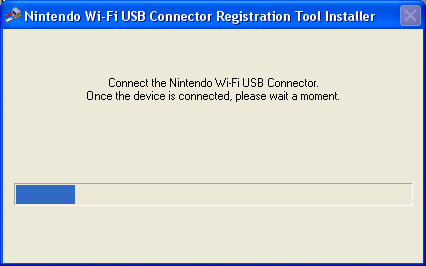 Once the software is installed, you must register your Nintendo DS using the Nintendo Wi-Fi Connector Registration Tool. 7. Turn the Nintendo WFC-compatible game on and enter the Setup Utility menu. This is a standard menu, shared by all games. 8. 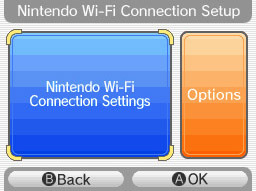 Choose "Nintendo Wi-Fi Connection Settings." 9. Do not choose a file. Instead, tap "Connect to your Nintendo Wi-Fi USB Connector." 10. 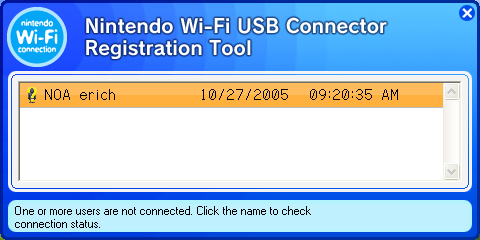 Make sure the Nintendo Wi-Fi USB Connector is attached to the PC, then click on the Nintendo Wi-Fi USB Connector Registration Tool icon in the lower-right corner of the Windows XP task bar. A list of currently-connected Nintendo DS systems will appear. 11. Tap "Ok" on the Nintendo DS to continue. 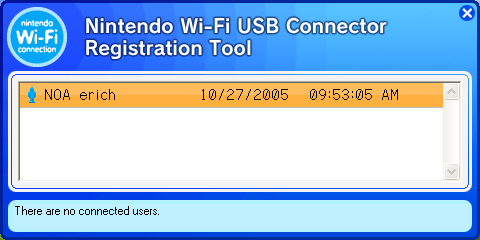 In the Windows XP registration tool, the Nintendo DS's nickname will appear. There will be a small, yellow "?" next to it. 12. 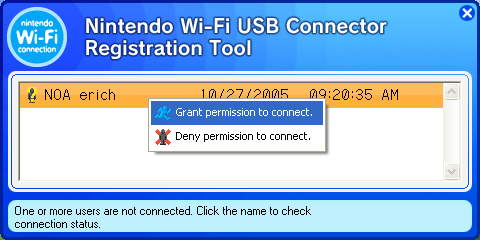 Click on the Nintendo DS's nickname and select "Grant permission to connect." A blue, standing man icon will appear next to the DS's nickname. 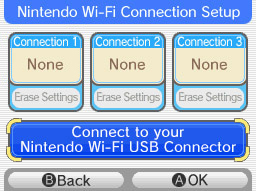 The Nintendo DS will now have permission to connect to the USB connector. Up to five Nintendo DS systems can connect to the adapter at a time. 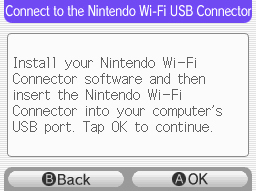 Complete installation procedures are provided in the Instruction Booklet included with the Nintendo Wi-Fi USB Connector.